I have been busy this week! 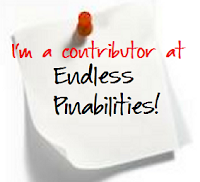 I have been at Pinnacle training this week. Pinnacle is a technology leadership program in my county. I am little bit on information overload, but it's been worth it! 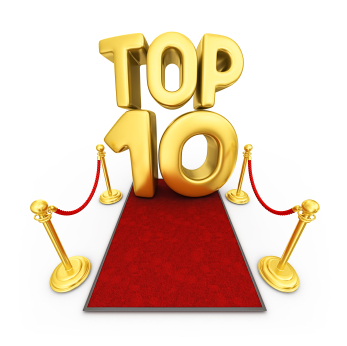 Here's my Top Ten list of the week! 9. Google Moments. We learned about lots of cool extensions and apps to use with Chrome. Some of my favorites were MoveIt, Snagit, and Tab Scissors. 8. The food! We have had some great food. Pizza, ice cream, gourmet popcorn, cookies! I think I've definitely gained some weight this week! 7. 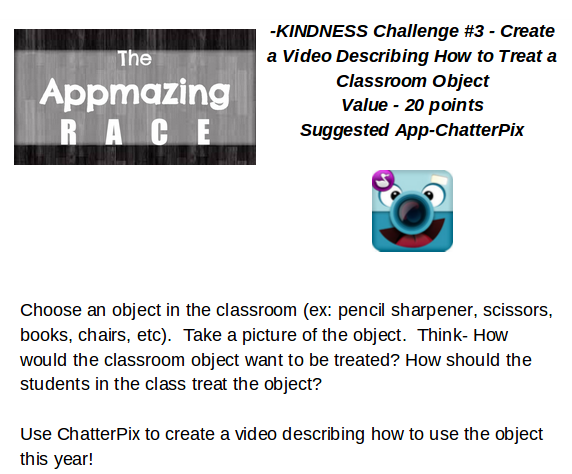 The App-Mazing Race Challenge! We were split into teams and given challenges using Apps on our iPads! Check out this link to see my team's work. (We were the first ones done....not to brag or anything! 6. 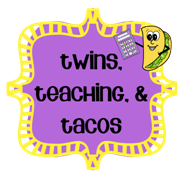 To go along with the App Mazing Race, I worked with some other 4th and 5th grade teachers to create a set of challenges that we can use with our kids during the first two weeks of school. So excited for it! Here's an example of one of the challenges. 5. Nearpod! Have you ever used it? We learned about it this week, I want to explore it a little more. I think it would be a great way to use the Chromebooks in a typically direct instruction type of lesson, making it more interactive. 4. We played Minecraft this week! Yep that's right! I know it's kind of a big deal, but I had never played! We discussed ways to use it in the classroom. 3. We made board games! 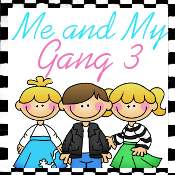 We talked a lot about gamification and we even made our own games. 2. Badges. 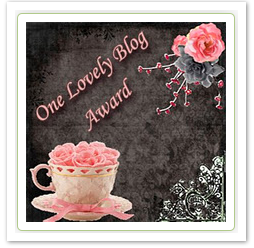 Who doesn't like an award? I think I'm going to do something similar in my room this year! 1. Collaboration and hanging out with my peers!! This is definitely the best reason for Pinnacle! I am totally not back in school mode and ready for school! Personalized learning is a great thing, but its a lot of work! Google Sheets can do a heck of a lot of stuff! 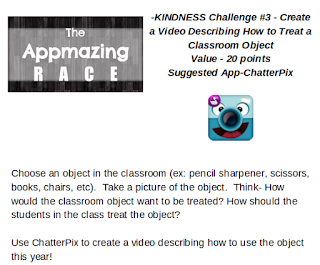 An App Amazing Race is a great idea to use in the classroom! Will I ever be ready for the new year???? Wowzers!! 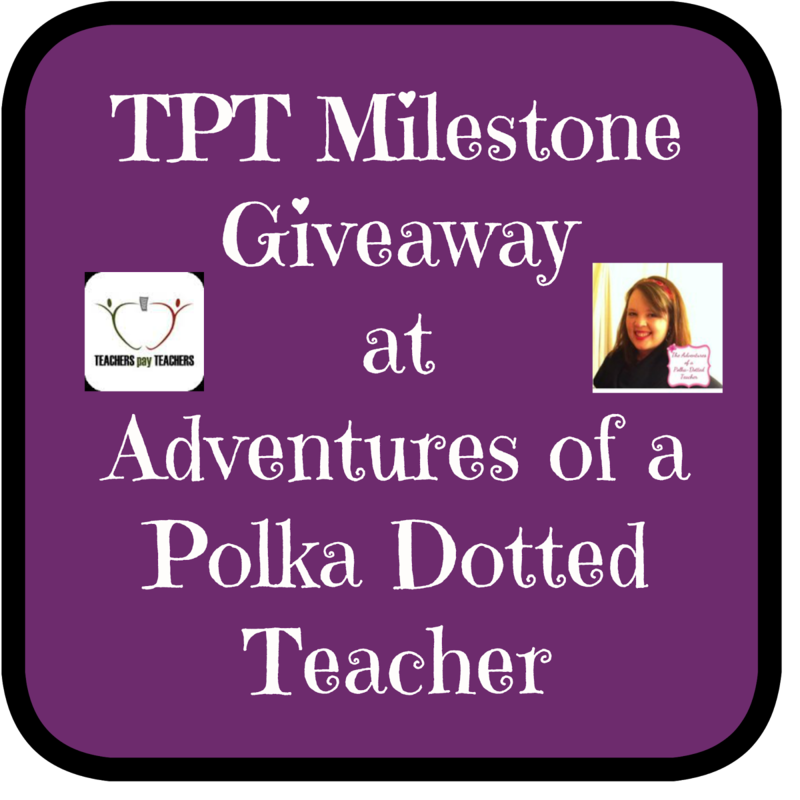 A TPT Milestone & a Giveaway! 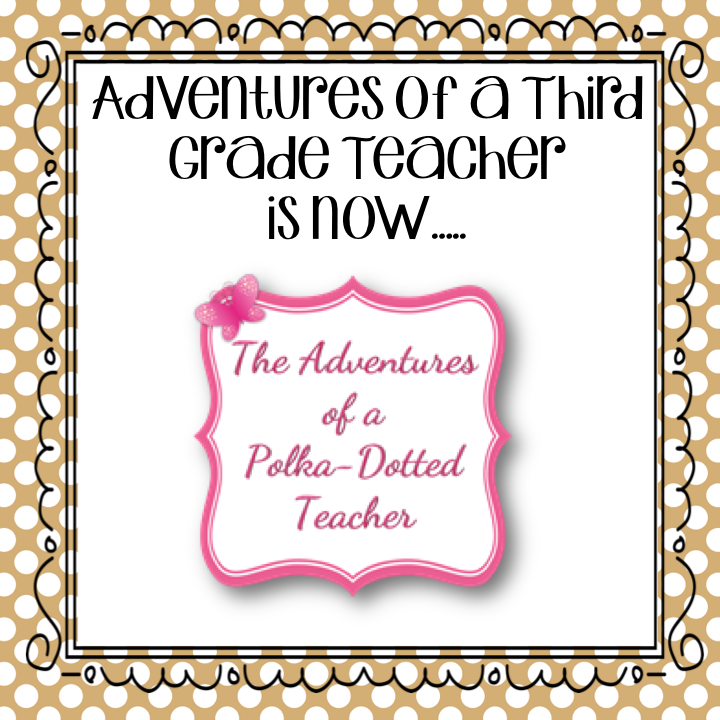 TeachersPayTeachers has truly changed my life! 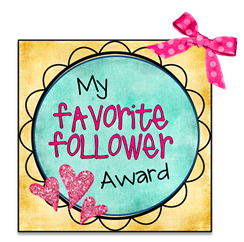 It has made me much more financially independent, paid for my wedding and helped feed my shopping addiction. 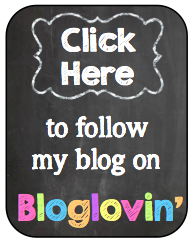 I have also met many new incredible friends through blogging and TPT. Not to mention, I love making a difference in student lives all over the world. Its such a blessing! 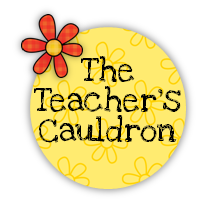 In celebration of reaching this Milestone, all of my lapbooks are on sale at TeachersPayTeachers. They will be 20% off through December 17th. Let's keep on celebrating by having a giveaway too! 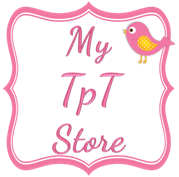 I'm giving away a $25 gift card to TPT. The details on how to enter are in the Rafflecopter below. The giveaway will end on Friday, December 20th! 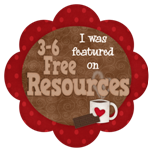 I am always looking for quality FREE apps to use with my kiddos! 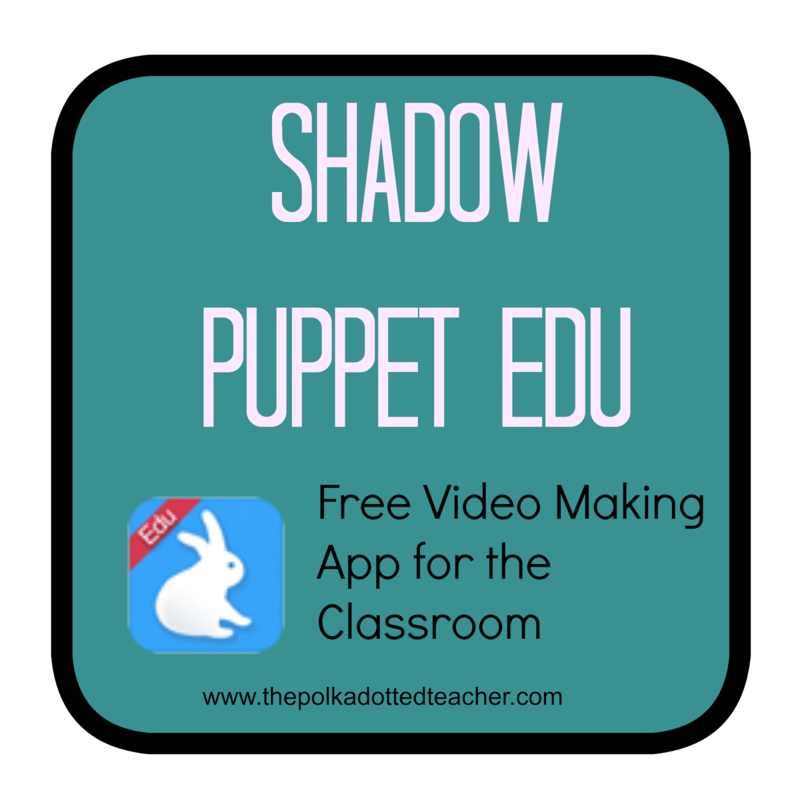 My awesome tech facilitator, Teresa, shared a great new app, Shadow Puppet Edu! Here is a video from the creators of the App! Students can do a web search through the App! Not only can you do a web image search, but you can also search NASA, Library of Congress, the Met Museum and More. You can also add images from your own camera roll too! To record voice, just hit Record and talk! Students tap through the photos in their slideshow and can pause as they go. The videos we made this week were fairly short, but I love that you can make longer videos! Especially if you wanted to make a class video! This is my favorite part! You can upload it straight to Youtube, Email it or Save to the Camera Roll! 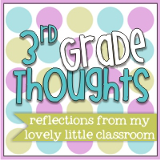 Shadow Puppet has some great ideas on their website that would be great for every classroom! My students had so much fun creating their videos! They loved watching each other's videos even more! 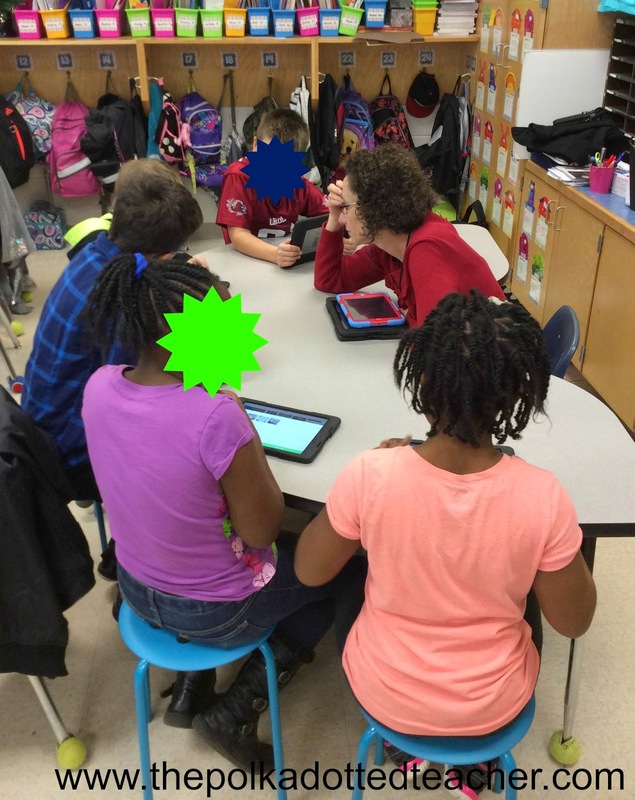 Luckily, my fabulous tech facilitator, Teresa, came into my classroom to help teach the students how to use the app! We started out simple and she taught them the basics of the app! Then, the students went on their own and recorded their videos! It was as easy as that! All of my students finished their videos in about 90 minutes. We kept our first videos pretty simple, but I'm looking forward to using the app again and using more of the features. Here are some of the finished products! Have you ever used this app? I'd love to hear about it! I am lucky enough to have a set of 12 iPads in my classroom this year, so it's been great integrating more technology in my classroom this year. 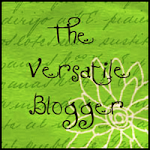 I have a project to share with you that is easy peasy, even if you don't have much technology. 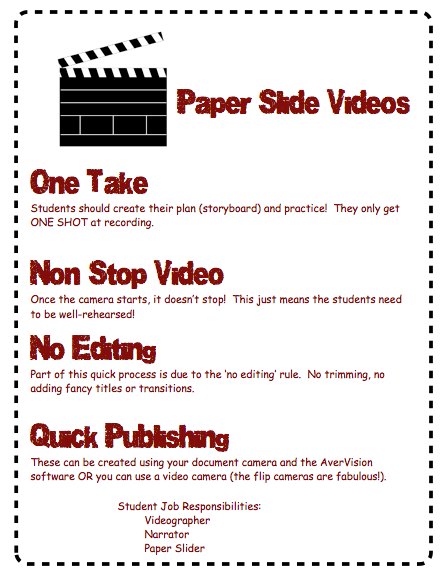 Paper Slide Videos are so easy to facilitate in your classroom and the students love them! All the technology you need is something to film with, such as a document camera, iPad, flip camera, iPhone, etc. 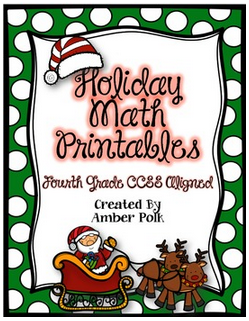 I introduced paper slide videos to my class using this great video! My class created paper slides videos about Rocks and Minerals. Since this was such a creative project, I had the students choose their groups and it worked out great! We were finishing up our Rocks and Minerals unit, so we brainstormed topics that they may want to share in their paper slide video. Then, they met with their group to plan out their storyboard. We kept it simple, we folded a paper into six squares and used this as a storyboard. After, the storyboard was planned out, the students created each individual slide. I encouraged lots of color, pictures, and diagrams and few words. Next, they wrote out their scripts so they knew exactly what they wanted to say. Now, it was time to practice, practice, practice! The last step was to record. Once the camera starts, it doesn't stop! There isn't any editing, so once they were done filming, it was done. The kids loved it! It took us about 4- 45 minute periods to complete the project from start to finish. Some students finished during our third time period, so I provided enrichment work for them while the other students were finishing up. Here a few of the finished products! The great thing about paper slide videos, is that they can work with any topic in any subject! 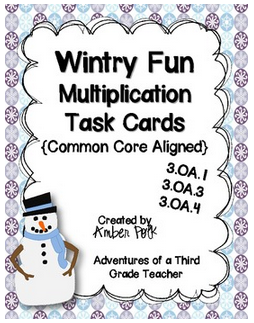 Have you ever completed paper slide videos with your class? i'd love to hear about it! 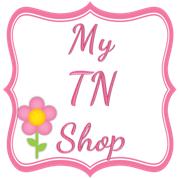 Cyber Monday Sale at TPT! Who doesn't love to shop? I do! In fact, I think that is all I have done the past two days! Well, it isn't time to stop yet. Tomorrow is Cyber Monday and I'm hoping to finish up my Christmas List, and rack up on some cool things I've been eyeing on TPT! I love this graphic from The 3AM Teacher! 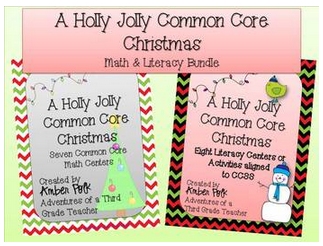 If you're looking for some Holiday activities, I have a few you can grab! 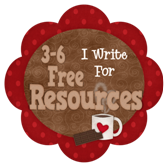 You can also grab this freebie! It's an oldie but a goodie! My whole store will be on sale until December 3rd, so if there is anything you have been eyeing, now is the time! Happy shopping! I'm going to fill up my cart now to get ready! Ladies and gents, I know I have shared how much I adore Google! Well, Google has stepped it up and added something I like even more! Have you heard of Google Classroom? I am in love! My district is completely Google, so our students have Google accounts already. If you have used Edmodo, it's similar but it is much more user friendly. 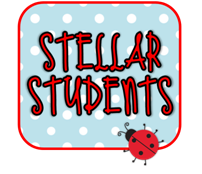 You can create classes, post assignments, post announcements, create conversations, post links to websites or whatever else your heart desires. Our school has three sets of Chromebooks, so we typically use those to access Google Classroom. 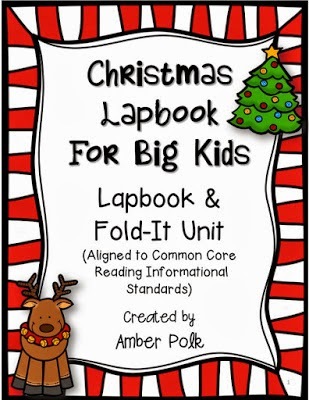 But your students can access it at home, at the computer lab, or even on iPads! 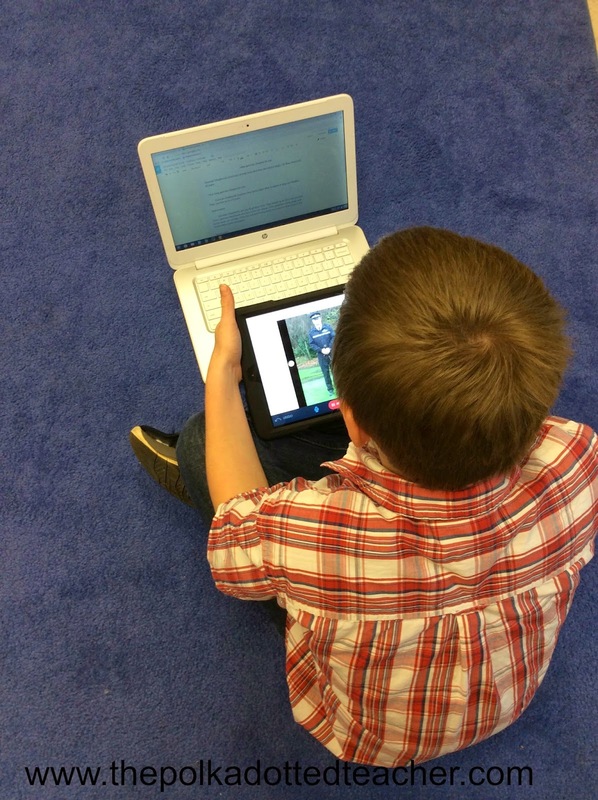 If you haven't used Google Docs or Drive before in the classroom, here is a great article by Jennifer Carey at Edudemic to help you get started. 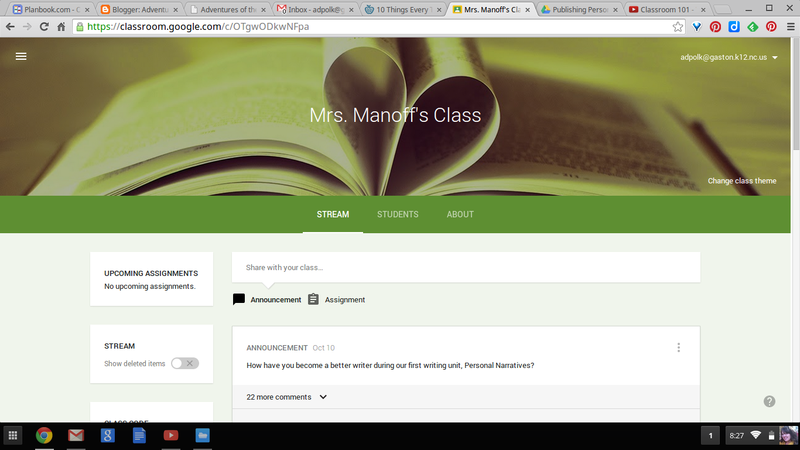 With Google Classroom, it is so much easier to implement Google Docs in your instruction. Here are my two biggest pet peeves about using Google Docs in the past with my students. 1. Students forget to make a copy of my template and mess up the original. 2. 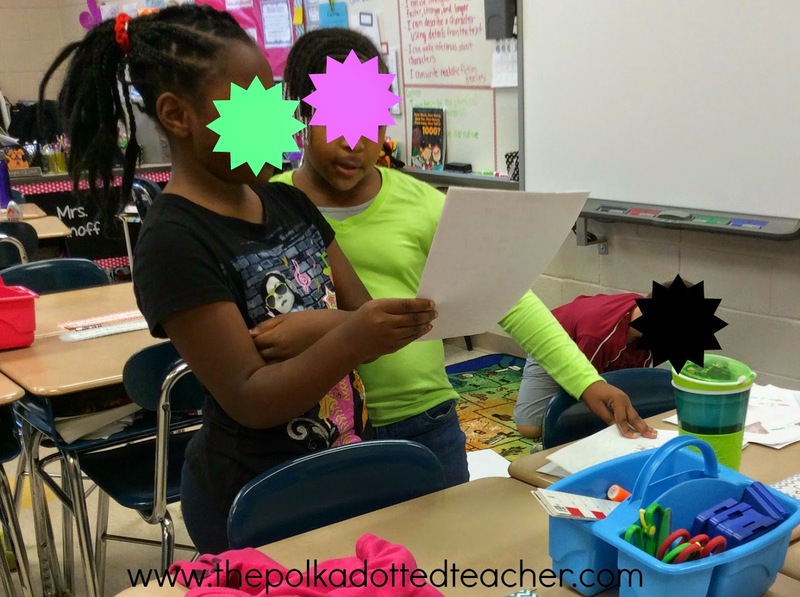 I can't see what my students are doing until they share it with me. Guess what? 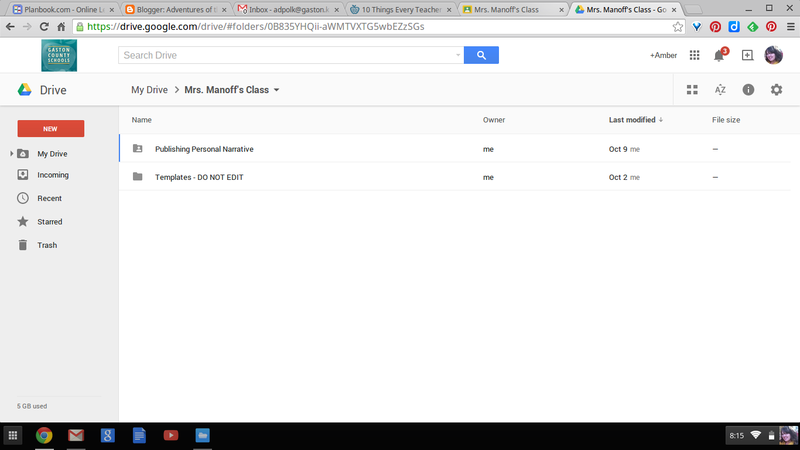 Google Classroom has solved these two problems! 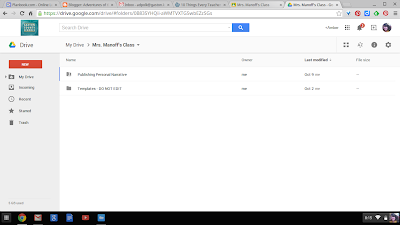 One you set up Google Classroom, it will set up a "Classroom" Folder in your Drive. Then, every time you create a new assignment, a folder within the folder is created. So everything is neatly organized and you can see how your students' work is progressing! During our writing celebration, I just shared the entire folder with my class. So the students were able to leave each other comments and suggestions. LOVE IT! I wish I could show you some more screenshots of what it looks like, but I can't because of my student's privacy! But it's easy peasy and you will be able to figure it out like that!! Classroom is still in it's beginning stages, but I can't wait to see what they throw at us next! Now that you've read what I had to say about Google Classroom, check out this video from Google to really see how awesome it is. Enjoy! 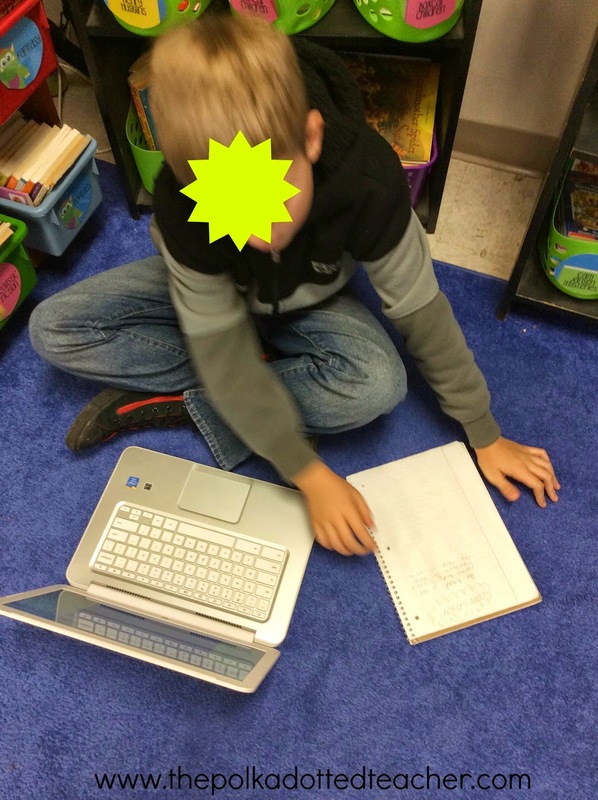 Are you using Google Classroom? If so, let me know what you love about it! !